Why choose this Travel guide over others? The Algarve travel guide is exactly that; it focuses solely on the Algarve covering 54 Cities, Towns and Villages. Most well-known guide books start off well then cover excursions to Lisbon and central Portugal which should be in a tour guide for Portugal not the Algarve. The Algarve Travel Guide: 54 Cities/Towns/Villages gives you the travel information that a good guide book should have. Covering brief history, events which include fairs festivals, exhibitions for every month of the year. Weekly markets, flea markets & antique fairs.Did you know there are even festivals for corn, sweet potatoes and even a giant cake with hard boiled eggs in? Most of these events are “free”. Fed up with the crowed beaches then it lists a guide to show you the hidden gems that many do not, includes a map of 60 beaches? Tips on Travelling, Airport contacts, Clock changes so never miss a flight, driving information, useful phrases, food translations, Golf courses, Zoo’s, Water parks & Campsites. Distance chart & Maps, the guide book is packed with everything you need. For you travel to the Algarve. As well as currently writing novels I hope to bring you more travel guides in the coming future, when travelling allows. 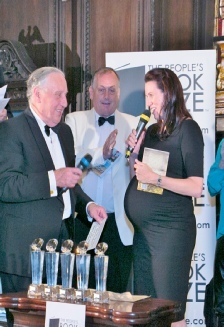 Being voted into the finals of the, ‘The people’s Book Prize’ was a great honour and I would like to thank all the readers who voted for my book. Having now just finished my adult fiction novel which I hope you will enjoy reading when it comes out very soon? As a writer I have a very wide genre and am constantly writing children’s stories, adult fiction, children’s novels and non fiction, so I hope there is something that you will find of interest that you enjoy reading?